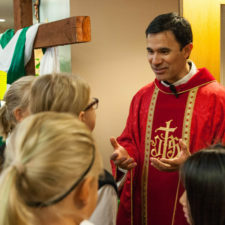 Catholic schools have a long standing tradition of providing faith, academic, and social experiences that prepare its students to be life-long learners and leaders in the church and the community. Bound by common goals and aspirations, students find an environment where peer pressure works toward education, an atmosphere where academic achievement is valued, and doesn’t conflict with social acceptance. Choosing a Catholic school will encourage your child’s individual interests and lay a foundation for a lifetime of achievement. St. John the Baptist Catholic School is called by faith to proclaim the Risen Christ through the lives and experiences of its parents, students and staff. It is committed to providing faith, academic, and social experiences to prepare its students to be life-long learners and leaders in the church and community as witnesses to the gospel of Jesus Christ.